The years of 1961 through 1970 had seen many good changes come to Etowah County area. One change that seemed to pop up overnight were the many, many good drive-in restaurants. The 1960s would have to be remembered as the decade when the hamburger became one of the best selling foods of all time. Drive-ins were found throughout the county with many of these places having better-than-average hamburgers. All one had to do was add an order of french fries and either a large coke or a milk shake to have a complete meal. Etowah County had many great drive-ins that were as unusual and unique as the food, especially the burgers that each place had to offer. Holt's Drive-In was located at 2300 Kyle Ave. in Alabama City aross from Emma Sansom High School. This small drive-in did not offer indoor dining. Holt's was famous for its great chili burgers. These hamburgers came with diced onions and chili. They had an outstanding at an unbelievable price of twelve sandwiches fro one dollar. This drive-inwas owned and operated by T. C. Holt. The Pic-A-Burger Drive-In was another very popular drive-in restaurant in Gadsden. The Pic-A-Burger was owned and operated by Mr. and Mrs. D. E. Locklear during its years of business. This very popular place sold a really good hamburger called the Paul Bunyan Burger. The Paul Bunyan Burger was a large hamburger that had a special sauce that gave it a very unique flavor. This big burger also came with an order of french fries and onion ring. The food at this drive-in was a distinc as the restaurant itself. The Pic-A-Burger was a popular place to hang out with many teenagers in the Gadsden area. The drive-in also did not offer indoor dining. Car hops waited on customers who remained in their cars. The Pic-A-Burger was located across from the Agricola Shopping Center. Another popular place to go for hamburgers in the Gadsden area was Jack's Kwikee Hamburgers taht was located at 601 East Meighan Blvd. in East Gadsden. This place offered three sizes of hamburgers as well as a wide variety of sandwiches. Jack's also offered a large selection of milk shakes and soft drinks for every kid. There was another location at 500 Meighan Blvd. These drive-ins were owned by Jack Alfond. 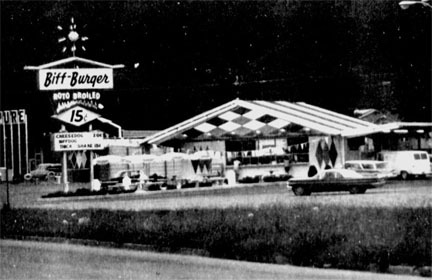 Over the years of the 1960s and early 1970s there were several locations of the Jack's Hamburger Drive-Ins throughout the county. Another very popular drive-in was the Magic Burger in Attalla. The Magic Burger was one of the first drive-ins where the customer would order at the rear of the restaurant. When your food was ready, you would drive around to a window and pick it up. This popular drive-in is still open today and serves food much the way it has for the last thirty years. There was, for a time, another, Art's Drive-In located on Rainbow Drive. The Magic Burger and Art's were owned by Art May. Another popular drive-in during the 1960s was the Biff Burger located at 301 North 12th Street. These burgers had a special sauce that gave them an unusual flavor. The Biff Burger was not only famous for their hamburgers, but for the "Battle of the Band" which it sponsored along with radio station WGAD. This was a competition where local and big name rock groups competed before large audiences at the Biff Burger. There were many other great places to get a burger located throughout the county. These home-owned and home-operated drive-ins paved the way for the large chain drive-in of today. These restaurants had great food and will be remembered by baby-boomers for many years. These great sandwiches were part of growing up in Etowah County.